Welcome to ~ See Ya’ By The Sea ~ our luxury 2,680 square feet home with an Italian flair, front row facing the ocean on beautiful 30A. Real wood burning fireplace for those cool nights. (Also see our brand new second house just finished built by custom builder at HomeAway #3843104) available to book now. 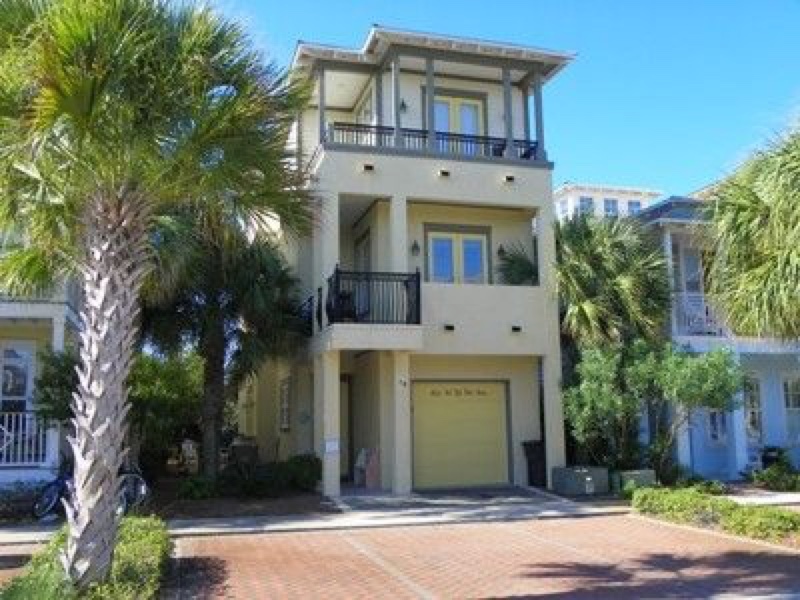 Both Located in the exclusive and private family friendly community of Seacrest Beach between Rosemary & Alys Beach and is close to Seaside, Watercolor, Destin and Panama City Beach. Florida’s, Emerald Coast with its famous white sugar sand beaches and clear blue waters of the Gulf of Mexico, are a true treasure for fun in the sun seekers. With deeded beach access (approximately 200 yards) 4 minute walk or call and get picked up at you door by Seacrest Beach Shuttle to be dropped off or picked up at the beach or walk 25 yards to the largest pool on 30A, 12,000 square feet with multi layers, waterfalls, fountains, 2 bath houses, plenty of area by the pool, lounge chairs provided, 1 minute walk. Explore local shops, restaurants, spa and bars on our 8 bikes, helmets provided. First Floor:: Enter the well lit main ground floor entrance from the North through a keyless coded locked 8 ft door into a welcoming foyer leading into setting room with bed/couch, reading lamp & TV. To the left, 8ft double french doors lead outside to a large fenced patio with child gate, table & chair setting area to relax & barbecue. Washer & Dryer are located in the hall way plus, to the south, is a large bedroom with TV VCR, queen bed plus a set of bunk beds and its own full bath. Double French doors lead out side to south facing covered patio. Fold out couch with bed. First floor is all large tile. NO STEPS EASY ACCESSABLE ENTIRE FIRST FLOOR. Fully equipped kitchen ready for that gourmet cook with Jenair island cook top, coffee maker, mixer, cooking utensils or just heat it up in the microwave or oven, get ice from the refrigerator serve it at the bar seats 3, open to the dinner table seats 6, plus high chair, in the high ceiling family with two couches, wood burning fireplace, 50 inch Plasma flat screen HDTV with Blue-Ray DVD player. Open the double 8 foot French doors facing South to a covered balcony with the some of the best views of the Ocean and Emerald Coastline. North from the Kitchen down the hall and you enter the second Master bedroom with King bed and setting chair & couch, closet, Flat VIZIO HDTV & DVD and its own full bath. Walk out through it’s double 8 foot French Doors to a private balcony. Third Floor:: Enjoy the openness at the top of the steps looking back down. Enter south to the large master bedroom with a King size sled Bed, setting chair, reading lamp, VIZIO HDTV & Blue Ray player. Walk out the double 8 foot French doors to your private covered balcony where you can catch those breathtaking sunsets with your unobstructed panoramic view of the Ocean & gulf Coast. Your Private Master Bathroom has two sinks and a shower & jacuzzi tub with jets. Go north from the top of the stairs and enter one of my favorite rooms, a children room. Beautifully professionally decorated, custom furniture, 2 full beds, setting area, VIZIO HDTV & DVD, Wii, books & toys, movies. With a crib by the entrance door next to the walk in closet. With its own full bath, shower & tub. Walk out of it’s Double 8 foot French doors (secured by a locking dead bolt) to your private balcony with high railings with a view of Seacrest Beach Resort. WE DO NOT ALLOW PETS, MAX 10 occupants without Pre-Approval & additional charge.